Honey is one of the oldest natural sweeteners people have been consuming, which has a lot of great health benefits that you might not be aware of. Honey has actually a lot to offer, from skin rejuvenation, helping in weight loss to fighting a hangover. One of the best things about honey is that it’s a natural cure with incredible taste. Check out the list of the most wonderful benefits of honey. If you want to increase your energy levels naturally, try adding honey to your eating plan and make sure you reduce your coffee consumption. Consuming honey is a more effective and natural way to get more energy. Spread a little bit of honey on your toast or mix a couple teaspoons of it into your tea. I also like to add it to my water. It’s also great to consume some honey before your exercise too, especially if you are planning to have a hard training. It’s one of the most widespread ways to use honey that really work. 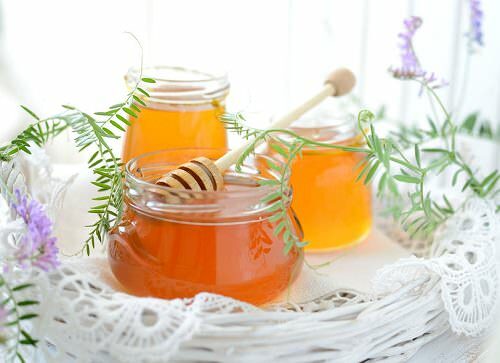 If you have a sore throat, honey may be a good cure for it. You can eat several teaspoons of honey, or mix it with a pinch of salt and a teaspoon of lemon juice to be a bit more soothing and effective. Honey is high in powerful antioxidants that help you boost your immune system, especially if consumed with lemon. In case you work in a place or area where you are often exposed to germs from the public, try drinking some tea with lemon juice and honey every day. Your child can also drink it to get through cold and flu season. If your child is under the age of 1 year old, you must avoid giving them any honey. Honey can also help you to drop those unwanted pounds. Consume it with warm water and lemon juice. Most people drink this mixture in the morning and say that it helps them. But, remember, you should consume honey in moderation. If you have trouble falling asleep, honey may help you. Add a little bit of honey to you cup of warm milk and drink it before you hit the sack. Honey helps you stay relaxed and calm and preps you for a great night’s sleep. This is one of the best benefits of honey to be aware of. If you’ve got a painful scrape that is not healing fast, try applying a little bit of honey to the area and allow it to sit for a while. If you want, you could even put a bandage over it. Honey boasts amazing antibacterial properties, and it helps reduce the swelling and pain. I’ve used this tip several times and can say for sure that it works like a charm! Did you know that honey can help you fight a hangover? Honey contains the natural sugars that help speed up oxidation of alcohol by your liver. So mix a little bit of honey with some yogurt and orange juice and drink this awesome hangover smoothie in the morning to get back to your normal self again. To tell the truth, I was greatly astonished to discover that honey can fight bad breath. However, it doesn’t mean that you can stop brushing your teeth each day! Brushing the teeth daily is a must. But if you cope with chronic bad breath problems, you can add a sprinkling of cinnamon and a teaspoon of honey on top of your toast to combat bad breath in no time. There are a great number of benefits of honey and these are only a few of them. Perhaps you have some honey sitting around in your cabinet, so why not whip up your favorite tea with honey and reap all benefits of it? Just don’t eat too much of it. Do you know some other reasons to add honey to any eating plan?